What is the correct body posture to prevent back injuries? Transporting heavy furnitures and large objects in an incorrectly way is one of the most common causes of back pain. You can reduce this risk by ensuring and using the stronger muscles (quadriceps) of the legs so they can be used to do the hardest and the most of the work. Keep your back completely straight every time. Bend your knees to lift the objects from the knees level. In case of a heavy box, kneel beside the box with feet about 30 cm apart. To raise it, rest it on the body. It is important that when you are lifting heavy furnitures you should bend your knees rather than your back. To leave a heavy piece of furniture on the floor it has to adopt the same principle, not to bend your body under any circumstances and always using the legs. For transporting luggage or shopping bags, you should try to balance the weights on both arms. It is less harmful to your back, to carry all the weight like this, rather that with one arm, which will make you lean to one side forcing your spine. 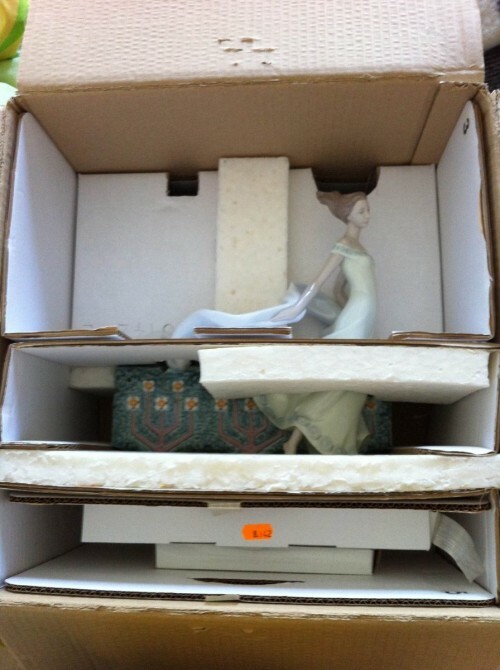 How to transport the porcelain figurines of Lladro and others? The most convenient, given the fragility of porcelain figurines, is to transport them with boxes (specially with the lladro box), but always, being involved with very soft material, foam or bubble wrap. When the porcelain contains many flowers, slender fingers or shapes with a high risk of failure, it is best to wrap them as little as possible and try to hold the porcelain box from the base. What the company, Cocowif, usually do with susceptible delicate porcelains of breakage is to put soft materials, and try to attach the porcelain figurine from the base. The materials we use are subject to the bubble wrap, bags of compressed air, rock wool or even cartons wrapped strategically placed; causing the porcelain figurine to be absolutely immobilized. With this procedure, we managed to avoid having to wrap the figurine of porcelain of Lladro, from the top and achieve by this way to reduce the risk of breakage at the most delicate moment of the process, which is the time when we have to take out the figurine of porcelain Lladro from the box. Remember, that the most important thing is to set correctly the porcelain to the base and for large figurines is very important to hold them with rapes from the trunk, of the figurine, but always being protected with bubble wrap between the porcelain and the rope.